Spy thrillers are generally sleek and seductive. They have the cold gleam of gunmetal with the occasional sparkle of a diamond-studded Rolex. The spy thriller is a debonair gentleman clad in the perfect black tuxedo. Tinker Tailor Soldier Spy is a different kind of spy movie altogether. Instead of a tuxedo, think an aged duffel coat, musty with the thick scent of winter rain. There’s no seduction or sleekness to the men that populate this world. All the movie star charm has bled from Gary Oldman, Mark Strong, Colin Firth, Ciarán Hinds. They’re old and faded; deep lines in their faces and the grey hairs on their heads. Retired MI6 agent George Smiley (Oldman) searches for the double agent within British intelligence, and there’s a dizzying list of suspects and evidence for him to filter through. Director Tomas Alfredson navigates the details of an intricate espionage mystery with a dexterous confidence. He’s more interested in capturing a mood of resignation, of a country in decline, than spelling out the details of Smiley’s investigation. 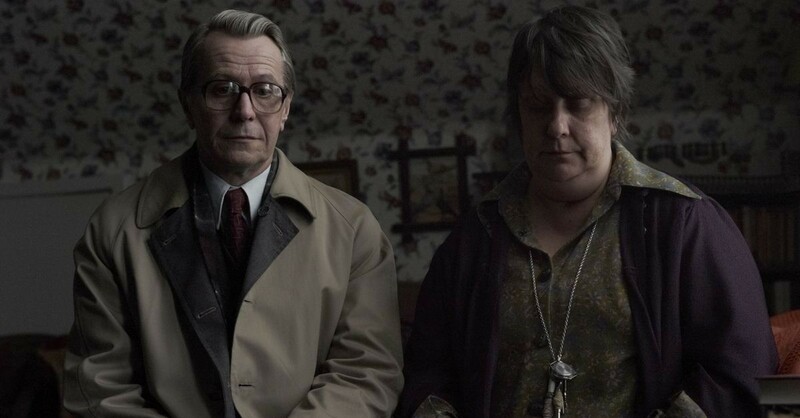 This leaves Tinker Tailor Soldier Spy with a density that’s hard to unravel after one viewing, but an atmosphere of sombre stoicism that will surely reward rewatching. Still confuses me a bit to this day, but for the most part, it was well-done. Needed to be a little bit longer, I’m afraid. Good review Dave. I admit I needed to peruse Wikipedia to fully unpack the intricacies of the narrative after watching the film. I appreciate films that require some effort from the audience, though, especially if they have an aesthetic as engaging as this one. Thrilled you enjoyed this one! I’m one of the few I think, who truly appreciate this film. Such an underrated flick, through and through. Hardy and Cumberbatch are phenomenal, and they’re just supporting here! Yeah, Hardy does a great job in such a minor role. Cumberbatch didn’t make a big impression on me here, though (not that I disliked his performance, just that it didn’t really stick with me). Not really my cup of tea, but I’m gonna give it a try at least. Nice review. This film is definitely not for everyone! Like you said to Dan, this is definitely a Wikipedia type of movie. I really dig the film, but damn, it gets complicated. Oldman, though, he’s the man. Yeah, it’s complicated as all get-out. It’s nice to have films with this much confidence in the audience’s intelligence though (even if, in my case, I’m not quite smart enough to pick it all up in one viewing).